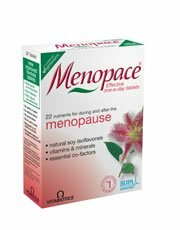 Vitabiotics-Menopace (90 Tablets)Women are increasingly looking to maintain health naturally during the menopause. MenopaceÂ® is a comprehensive formulation of 21 nutrients, which can be taken alongside or independently of Hormone Replacement Therapy (HRT). Great Deals & Offers On Vitabiotic - Menopace - 90 Tablets . FREE Delivery On ALL Items.